For other uses, see Devils Hole (disambiguation). Looking into Devils Hole; the dark area is the surface of the water. 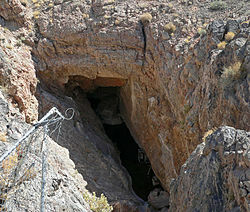 Devils Hole is a geologic formation located within the Ash Meadows National Wildlife Refuge, in Nye County, Nevada, in the Southwestern United States. Devils Hole—a detached unit of Death Valley National Park—is habitat for the only naturally occurring population of the endangered Devils Hole pupfish (Cyprinodon diabolis). The 40 acres (16 ha) unit is part of the Ash Meadows complex, an area of desert uplands and spring-fed oases that was designated as a National Wildlife Refuge in 1984. Devils Hole is a geothermal pool within a limestone cavern in the Amargosa Desert in the Amargosa Valley of Nevada, east over the Amargosa Range and Funeral Mountains from Death Valley. Its waters are a near constant salinity and temperature (92 °F or 33 °C). The cavern is over 500 feet (150 m) deep and the bottom has never been mapped. A viewing platform overlooks the hole. Devils Hole branches into deep caverns at least 300 feet (91 m) deep from an opening at the surface that is approximately 6 by 18 feet (1.8 by 5.5 m). According to geologists, the caves were formed over 500,000 years ago. The pool has frequently experienced activity due to far away earthquakes in Japan, Indonesia and Chile, which have been likened to extremely small scale tsunamis. Devils Hole is the only natural habitat of the Devils Hole pupfish, which thrives despite the hot, oxygen-poor water. It is an IUCN Red List endangered species. The pupfish has been described as the world's rarest fish, with a population of less than 200 since 2005. Genetic information indicates that the pupfish species is as old as the Hole itself, which opened to the surface about 60,000 years ago. The pupfish have been protected since being declared an endangered species in 1967. Conflicts of the ownership and use of the groundwater around Devils Hole caused litigation in the 1980s. The litigation triggered further protections of the pupfish. However, since the late 1990s, the pupfish population has substantially decreased. The reasons for the decrease are unknown, but is possibly due to a microscopic non-indigenous beetle that is consuming pupfish eggs. ^ a b "Devils Hole". National Park Service. Retrieved 28 January 2014. ^ Landwehr, J.M. ; Winograd, I.J. (2012). "Devils Hole, Nevada—A Primer". U.S. Geological Survey. Fact Sheet 2012–3021. Retrieved 2013-01-17. ^ NatureServe (2014). "Cyprinodon diabolis". IUCN Red List of Threatened Species. 2014: e.T6149A15362335. doi:10.2305/IUCN.UK.2014-3.RLTS.T6149A15362335.en. ^ "In a hole". The Economist. Retrieved 2016-05-10. ^ a b c "Devils Hole Pupfish". U.S. Fish and Wildlife Service. December 2, 2013. Retrieved 2016-05-14. ^ Walker, Matt (23 June 2016). "We know where the world's loneliest species came from". bbc.com. Retrieved 24 June 2016. ^ Sağlam, İsmail K.; Baumsteiger, Jason; Smith, Matt J.; Linares-Casenave, Javier; et al. (2016). "Phylogenetics supports an ancient common origin of two scientific icons: Devils Hole and Devils Hole pupfish". Molecular Ecology. 25 (16): 3962–73. doi:10.1111/mec.13732. PMID 27314880. ^ Minckley, WL; Deacon, JE (1991). Battle against extinction: native fish management in the American West. Tucson: University of Arizona Press. ISBN 978-0816512218. ^ Bittel, Jason. "Brutal beetles kept world's rarest fish from breeding—until now". National Geographic. National Geographic. Retrieved 5 March 2019. Wikimedia Commons has media related to Devils Hole. "Devils Hole". Geographic Names Information System. United States Geological Survey. Retrieved 2009-08-10. The Southwestern Naturalist: "Pupfish Populations"
This page was last edited on 5 March 2019, at 02:22 (UTC).